While gas was $1.29 a gallon in most places around Buffalo, just over the Peace Bridge in 1980, it was 88 cents a gallon. Many Western New Yorkers will recall long lines at the bridge as Buffalonians crossed en masse to save a third of the cost of a fill-up. 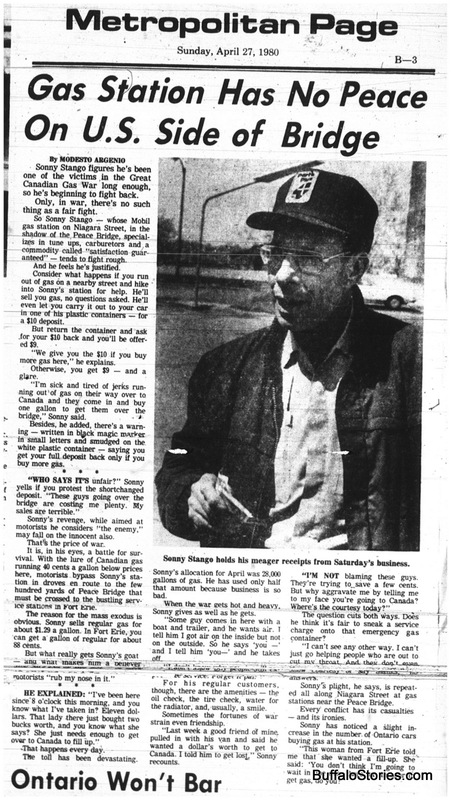 While the high price of gas hurt most station owners around Buffalo, none was hurt more than Sonny Stango. He could just about see Canada and the Peace Bridge from his West Side gas station. Folks who used to come in for a fill-up were now just looking for a gallon — just enough to get over the bridge. Stango decided to take measures into his own hands, as much as he could. "Gas station has no peace on this side of the bridge"
" 'I’m sick and tired of jerks running out of gas on their way over to Canada and they come and buy one gallon of gas to get them over the bridge,' Sonny said."